Just a quick note to let you all know I am taking the day to relax and unwind. After the events of this past week, I really need to take a day to decompress, get my bearings, and charge my batteries. Literally. As most of you who frequent my site already know, I enjoy keeping track of our elected officials and writing about politics is one of my favorite things to do. But you might not know that I have two other passions. Photography and birding. I know I have mentioned a birding trip here and there, and I have posted a few photographs when we’ve seen some bird that’s really cool. So, it should come as no suprise that I have added a birding category to the site, as well as a few really good birding links. All of you people who follow my political rants will have to put up with a few birding posts from time to time, and you birders will have to deal with those political rants in-between all of my birding stories. 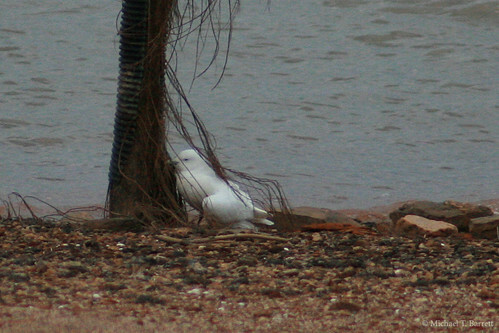 Okay, that’s it for tonight, except… What the heck is that bird sitting on the bouy? Click on the image to enlarge it. I can’t figure out if it’s a Double Crested Cormorant with weird white coloring or some other bird. Okay, so my newbie-ness of birding is showing, but I don’t care. I can’t learn if I don’t ask questions, now help me out. What is it? 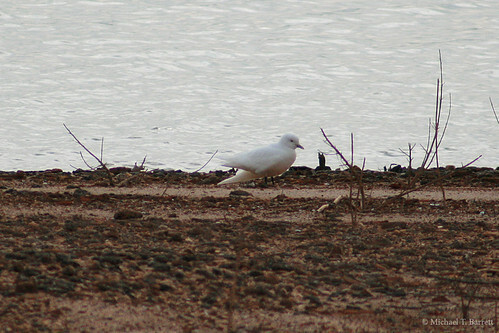 On Monday, January 25th, just after 1pm, a gentleman from Columbus, Georgia spotted a possible Ivory Gull on the water at West Point Lake, in Troup County, Georgia. After hearing of his report, several birders were able to get to the lake in time to positively identify the bird before the sun went down. Being relatively new to birding, I didn’t really understand the significance of this find until later the next evening. 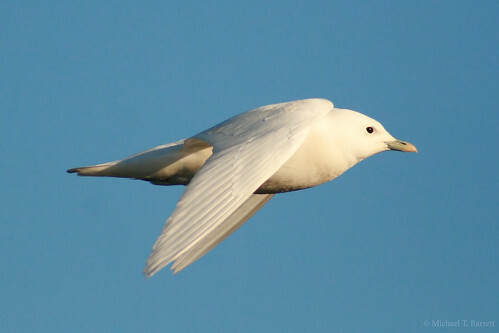 As I sat at my desk on Tuesday, I read update after update about the Ivory Gull from several different people, so I decided to see what all the hubbub was about. A few quick searches on the Internet made it clear why everyone and their brother was excited about seeing this bird, and rushing to get a glimpse of it, especially here in Georgia. 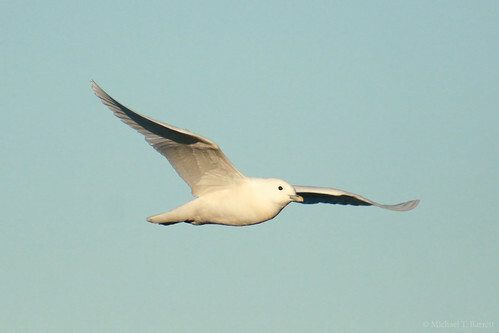 The Ivory Gull Pagophila eburnea is a small gull, the only species in its genus. It breeds in the high arctic and has a circumpolar distribution through Greenland, northernmost North America, and Eurasia. It migrates only short distances south in autumn, most of the population wintering in northern latitudes at the edge of the pack ice, although some birds reach more temperate areas. Ivory Gull counts in the Canadian Arctic have recorded losses of 80% over the last 20 years, and 13 breeding colonies have vanished. 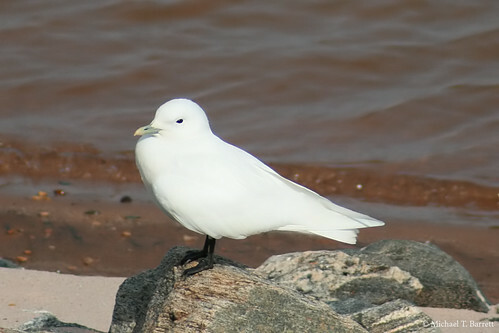 Between 1979 and 2001, Canada considered it a “species of concern.” In 2006, the bird’s listing was escalated to “endangered.” Over the same period, BirdLife International, on behalf of the World Conservation Union (IUCN), reclassified the Ivory Gull from a “species of least concern” to “near threatened.” Reports from several Inuit communities corroborate these negative trends. I suddenly understood the importance of this sighting and decided to make the trip to West Point Lake sometime on Wednesday. It was a once in a lifetime chance to see a rare bird and I wanted to make sure that the avid birders of the family (our three boys) got a chance to see this magnificent rare bird before it flew back home. I worked longer than I had expected on Wednesday, but we were able to observe the bird for three hours before it got dark. 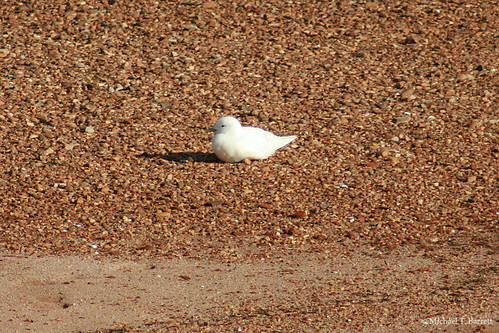 When we arrived I thought we might have trouble spotting the bird, but the Ivory Gull stood out among all of the other gulls in the area. We spent time on the West Point Dam speaking to more experienced birders who had been watching the bird before we arrived. While we watched the bird from the dam, the Ivory Gull would fly from the boom area in front of the dam, up and over the top of the dam, and then fly down river around the bend. Ten to fifteen minutes later the bird could be seen flying back upstream, over the dam, and back into the boom area. We had an awesome time that first day, and I got some of the best photographs of a bird I have ever taken. Several out of town (and out of state) birders were planning on coming from all over the place to see the bird. Because of our experiences the day before I decided to take Thursday off as an “educational” day for the boys. 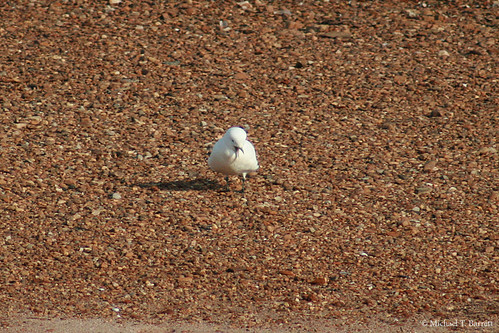 I figured we could get down there as early as possible to see the gull again and maybe view some of the other birds in the area. When we arrived on Thursday morning there were half a dozen people already observing the bird, which was then located on a small strip of beach at the west end of the dam. The boys were able to observe the Ivory Gull with the naked eye, as well as the Forster’s Tern, the Common Loon, and the Common Goldeneye thanks to those in the group with scopes that offered the kids a look. We quickly learned that the Ivory Gull’s behavior had changed dramatically from the three days before. We arrived around 9:30am and the bird had not flown to feed, or for any other reason, since the first birders arrived at sunup. In observing the bird the day before, it would fly every 30 to 45 minutes, regularly. 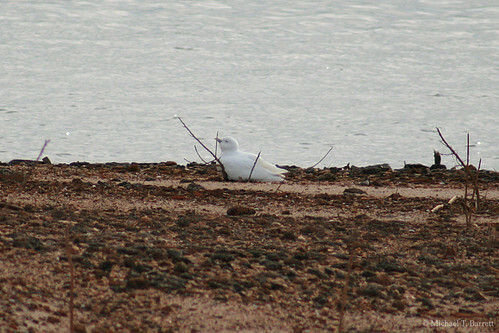 The Ivory Gull would stand occasionally, spin around once, and sit back down on the beach. It seemed rather lethargic, but it was quite responsive when other birds flew too close or the occasional beaver swam by. The bird followed this same behavior most of the day. The first time it flew, sometime around the 1 o’clock hour, it flew because a beaver swam too close. When it flew, it landed out in the water past the boom, and sat there floating in the water for a long time. A boat stirred up the Double Crested Cormorants hanging out on the boom and they spooked the Ivory Gull, which flew back to the shore just east of the beach it had previously been resting on. It didn’t take long before it flew from the rocks back to the beach itself, where it sat for most of the remainder of the day. Many of us theorized about why it was lounging on the beach. Ideas ranged from “it’s resting up for it’s big flight home” to “if you were suddenly sitting in temperatures 60 degrees warmer than you were used too, what would you be doing”. Many of us were baffled and quite concerned at the bird’s behavior. As the day dragged on, we became more concerned. The fourth, and final time, it flew for the day was around 6pm when it was flushed by another photographer who approached too close. 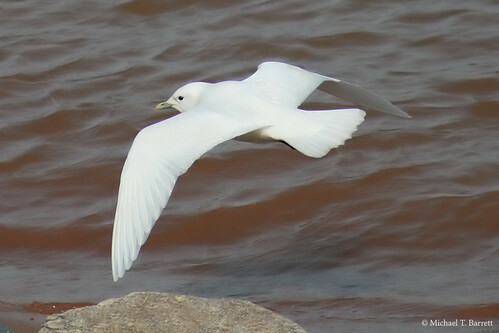 The Ivory Gull flew from the beach out into the lake and then up and over the dam. 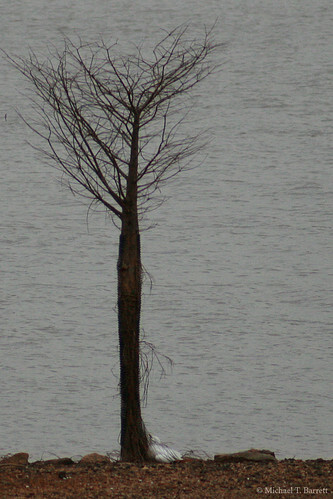 We walked back down to the dam to see if we could locate it again, and in the process spotted a Bald Eagle in a tree on the west side of the river. We kept an eye out for the return of the Ivory Gull while we ventured down to see of we could get a photo or two of the Bald Eagle before we lost what light was left in the sky. We got some good photos of the Bald Eagle as it flew back down river, and just minutes after it disappeared, we spotted the Ivory Gull circling, soaring, and diving to the water with the other gulls. 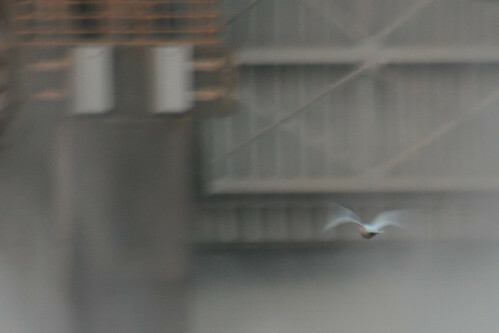 This is the last photo I got of the Ivory Gull in flight. The quality is poor because of the low light, it was 6:20pm according to the time stamp on the camera. (My camera was off an hour so the time stamp actually shows 7:20). Watching the bird attempting to feed with the other birds got us quite worked up. At the time, we figured it may have been the heat of the day that kept the poor thing beached, and since the temperature was cooling as the sun went down he was feeling better. Circumstances in the home office made it possible for us to visit the bird again today, Friday, January 29th. We made the trek down to West Point Lake again this morning arriving at 9:30. We checked the boom area by the dam, to no avail. We scanned the waters out farther but had no luck. We arrived at the beach it had been resting on the day before and it wasn’t there either. Just moments after arriving, a nice woman stopped to let us know it was around the bend across the small inlet from where we were standing. As we looked up, we could see a small snow-white speck on the beach across from us. We high-tailed it back to the truck and drove around to the road where a lot of other people were parked. As we walked up we were not prepared for what we found. We were shocked. The Ivory Gull was clearly in distress, and we could see it had additional injuries, including a broken wing, that it did not have at 6pm yesterday. We spoke to other birders and a park ranger at the scene to find out the bird had not flown since daybreak. It had taken to the water once for a few minutes but had otherwise stayed on shore all morning. At one point it looked as if it was praying, which brought a tear to our eyes. We had only planned to stay until 1pm today, as there was a cold front and storms moving in, but we felt we had to be there to do what we could for the bird. Another birder went to the store and brought some raw chicken to the shoreline, hoping the bird would be interested in eating. It wasn’t. The Ivory Gull seemed disoriented and its breathing was quite labored. It was clear the bird did not have long to live if it didn’t receive aid of some kind. The ranger was under the impression that some birders had called a rehabilitation expert, and the birders were under the impression that the ranger had done the same thing, so it turned out that no one had been contacted until much later in the day. It was much gloomier and colder today which made it much more difficult to get good photos, although photos were the last thing on my mind. More importantly, it was more difficult to keep three young boys happy and warm. As the day grew longer the temperature continued to drop. After much consternation on our part, we spoke to the ranger who did an outstanding job making sure the bird would be taken care of, and then we began the trek home. 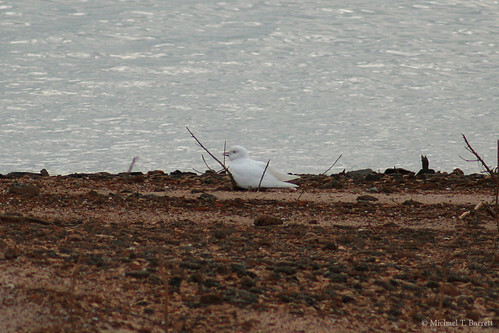 This is the last photo I took of the Ivory Gull before we left. We were less than 30 minutes from home when I received a call from another member of Georgia Birders Online (GABO) who had arranged for an avian veterinarian to treat the bird if we could get it transported up to Atlanta. I told her we would start heading back down to the lake in case no one else was close to the lake, so we could assist in transporting the bird up to Atlanta. I didn’t have any contact numbers for the ranger (or anyone else still down there) so she was going to make some calls to see if anyone else was down there who could transport the bird. 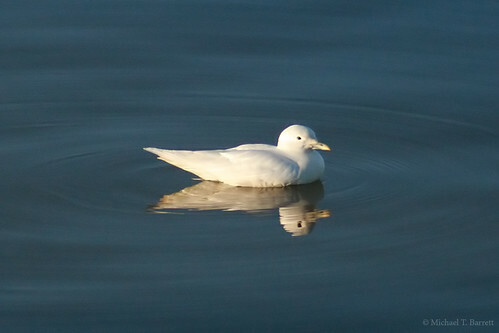 The Ivory Gull graced us with its presence and allowed us, and hundreds of others, to enjoy its beauty for several days. The least we could do is take a couple hours out of our day to help save its life. Less than 30 miles back down the road we received another call letting us know that the ranger and another birder were in the process of transporting the bird to a rehabilitation expert. With a sigh of relief, we turned around and finished our journey home. Our relief, however, quickly turned to sadness when we walked in the door and learned that the bird, the most beautiful and graceful looking bird I have ever seen, had died. God grants us blessings to be a blessing to others. I truly believe we were granted a blessing in being able to witness this beautiful bird, and I hope this post has revealed what an impact this bird has made on me and my family. We will never forget the past three days, and I hope you won’t either. While my heart is filled with sadness that the attempt to save the Ivory Gull failed, I thank God for allowing us to see this tiny creation of His, to enjoy its beauty, and to realize once again that all life is fragile and precious.